My Virgin Atlantic flight dropped into Tokyo's Narita airport under bright blue skies making a very pleasant change from Wiltshire, where it feels as though it's rained almost non-stop for months. Checking into my hotel, I made a few calls and, further to one of them, met a client in the late afternoon at the Foreign Correspondents' Club for a bottle of wine. Dinner followed: a very kind invitation, as it was essentially a send-off for a retiring work colleague. One of those present, a talented magician, performed an array of mind-boggling tricks later on. Perhaps a little too much shochu was consumed. This local drink, distilled from grain, potatoes, rice (or even carrots, I am told) is like watered down vodka with a mild nutty flavour. Whether it was my wakefulness on the 'plane journey on the way over or the shochu, I fell into a deep sleep once back in my hotel room, only to be woken sometime around 2am by a tannoy announcement instructing me not to worry about the earthquake that was taking place. At its epicentre somewhere offshore it registered 6.8 on the scale and was enough to make my hotel sway and groan like a windjammer in a good blow. There have subsequently been a number of more minor wobbles and I always find them slightly disconcerting. One can usually be confident, after all, that the ground is reassuringly flat and reassuringly still. I can well understand why those who experience really big tremors require a degree of counselling thereafter. Since then, I have been enjoying excellent food in the way of sushi and sashimi, delicious sticky pork belly meat in an equally sticky bun, obscure looking seafood that we've cooked at the table on a gas burner. 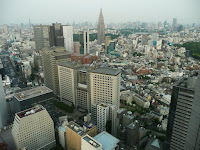 And I have enjoyed that spectacular view that one gets from the top of that lofty hotel, the Park Hyatt in Shinjuku, which will forever be referred to as "that hotel where they shot Lost in Translation". Off to Hong Kong tomorrow where the summer heat has started. I anticipate 11 days of feeling like I've been boiled in a sock.